If a picture is worth a thousand words, what’s the worth of these two pictures? The point? Surface area increases more quickly that volume. Breaking up a once solid material and trying to fit it back into the same area that it once occupied causes the waste material to expand beyond the hole that originally contained the original resource. As a result, the waste materials must be draped over the surrounding landscape. 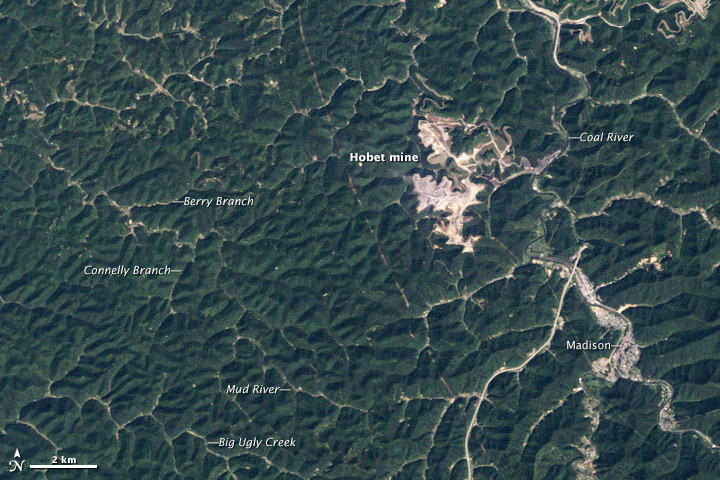 For more information on this West Virginia location, visit NASA’s Earth Observatory site that provides further details about these images. Posted by Jill S. Schneiderman in book review, John Burroughs. 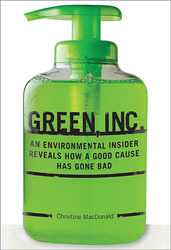 Democracy Now has a good piece on Green, Inc.: An Environmental Insider Reveals How a Good Cause Has Gone Bad, by Christine MacDonald. In short, MacDonald is a journalist who worked for Conservation International (CI), an organization whose stated mission, paraphrased, is to build on a foundation of science, partnership and field demonstration in order to empower societies to care responsibly and sustainably for nature for the well-being of humanity. 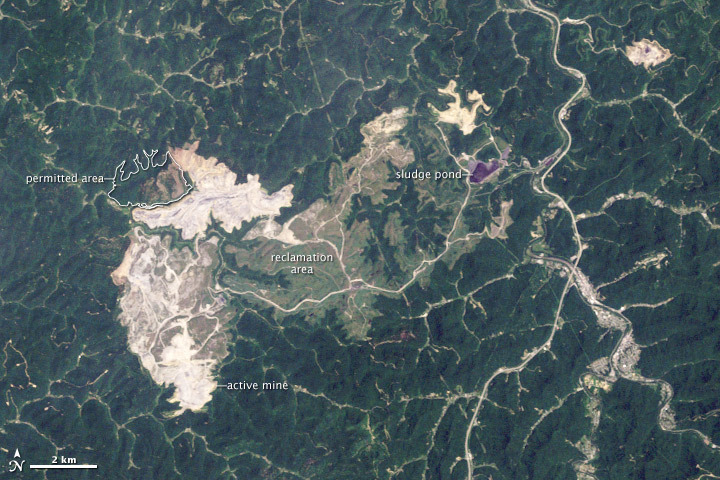 Though founded in the late 1980s, I hadn’t heard of this environmental nonprofit; from information on its website, it seems to strive towards a people-focused environmentalism. In her interview with Amy Goodman however, MacDonald charges that CI and other major environmental groups, essentially operate satellite public relations offices for polluting corporations. I’m not surprised by the claim. Robert Gottlieb, years ago pointed out in his book Forcing the Spring: The Transformation of the American Environmental Movement, that there was an “Iron Triangle” between government agencies, corporations, and congressional leaders that sets the framework for policy based largely on economic interests. It sounds to me like MacDonald in Green, Inc. might offer some 21st century proof of Gottlieb’s contention. What MacDonald had to say reminded me of the fact that President Teddy Roosevelt took nature writer and bird enthusiast John Burroughs on a camping trip to Yellowstone in 1903 in order to soften TR’s image as a large-mammal slayer. Burroughs seems to have allowed his persona to be used by Roosevelt, as well as by industrial titans E.H. Harriman, Henry Ford, Harvey Firestone, and Thomas Edison on other excursions into Nature. Perhaps Burroughs justified being coopted in the same way that environmental organizations today soft-pedal their ‘collaboration’ with corporations, as being for the greater good. In any case, I want to read this book. Posted by Jill S. Schneiderman in Andes, Buddhist concepts, Chile, disasters, earth community, earth cycles, earthquakes, environmental justice, geology, Haiti. Oddly enough, given the topic of collapsed infrastructure as a result of recent high magnitude earthquakes in Haiti and Chile, a visible viaduct has emerged which connects the agonizing reality of these events to the timeless truth that economically and educationally impoverished people are disproportionately vulnerable to risks posed by life on a dynamic planet. How is it that these two seismic events in the first quarter of 2010 have together exposed Govinda’s bridge? In order to answer that question we must compare geologically these natural events. Both earthquakes occurred at lithospheric plate boundaries. Geologists have come to expect earthquakes at these locations because such boundaries, which are delineated by earthquakes and often volcanism, are the relatively flexible seams that connect pieces of comparatively inflexible crust comprising the skin of the earth. When rigid crust moves, it releases energy stored in the rocks causing them to break abruptly. This is a fundamental geological reality that all human beings must understand, as a starting point, if we are to lessen the catastrophic human consequences that follow from such natural events. Both temblors were massive — Chile magnitude 8.8 , Haiti 7.0. In fact, the Chilean event ranks among the largest quakes ever measured. A substantial geological difference between the Chile and Haiti tremors was that the former originated deep in the Earth’s crust, 35 km, while the latter one had a shallow focus, 13 km. The difference in the depth of the rupture relates to the type of plate boundary at each site — sideways sliding in Haiti versus downward thrust in Chile. And though to the geologically uninitiated the difference between 8.8 and 7.0 may seem negligible, the Richter scale is logarithmic, not linear, and that means that the Chilean quake was substantially stronger than the Haitian one. These geological details beg the human question, why do the numbers of Haitian deaths and catastrophic injuries eclipse Chilean ones? The answer to the question has socioeconomic, rather than geologic roots. An adage well known to geologists reads, “Earthquakes don’t kill people, buildings do.” Many Chileans were spared crush-injuries and death because Chile constructed quake-resistant buildings after experiencing a 9.5 magnitude earthquake in 1960. In this recent event, buildings shook but did not collapse into stacks of flattened concrete, minimizing the chance that Chileans might be killed or trapped inside them. Too, the Chilean quake struck near Concepcion, a region of much lower population than Port-au-Prince. We can build earthquake-resistant structures with adequate know-how and financial resources. Concrete, a common and relatively strong masonry material consists of cement — primarily heated limestone that is finely ground and mixed with the mineral gypsum—that binds together sand and gravel. But concrete doesn’t stretch or extend very well when stressed by shearing horizontal forces. It can be reinforced with steel bars or pre-stressed for use as an earthquake-resistant building material. Other elements of an earthquake resistant building include a good-quality foundation and high quality cement. Living on land prone to shift, Chileans endure constant reminders of the need to utilize high quality building materials and enforce strict building regulations. Haitians also receive portentous jolts. But Chile, not Haiti, is one of the most earthquake-ready countries in South America, Central America and the Caribbean. Why are buildings in Chile more stable than those in Haiti? While 98% of Chileans are literate and 18% of the population lives in poverty, the respective numbers for Haiti are 53% and 80%. These numbers may explain why Haitians have used brittle steel without ribbing and poor quality cement to hold together concrete. And using cement too sparingly for mortar between concrete blocks or in the production of the concrete itself reduces the earthquake resistance of the structure built with it. In Haiti inferior building materials and poor building practices have been replicated from the foundation up. As a result, the Haitian earthquake left more than 200,000 people dead, nearly one million people homeless, and an indeterminate amount of pain and anguish; in Chile we may hope that the death toll will not reach four digits. When we examine a geologic map of the world, an unfortunate reality becomes clear: the earth’s most populous cities exist along plate boundaries. Plate boundaries coincide with shorelines and sources of water hence our earliest civilizations arose there and grew to be villages and towns. Today large population centers in places like Tehran and Istanbul are disasters waiting to happen. Though geologists cannot predict when an earthquake will occur, we can forecast, in decades-wide windows, the inevitability of such events. Haphazardly constructed communities in vulnerable mega-cities put millions of people at risk for the suffering that ensues after a large earthquake in a poorly prepared region. The Buddha taught that suffering is endless yet one must vow to end it. Anyone who subscribes to this principle must reject as unacceptable the disproportionate vulnerability of the poor and under-educated to the earth’s perpetual processes.